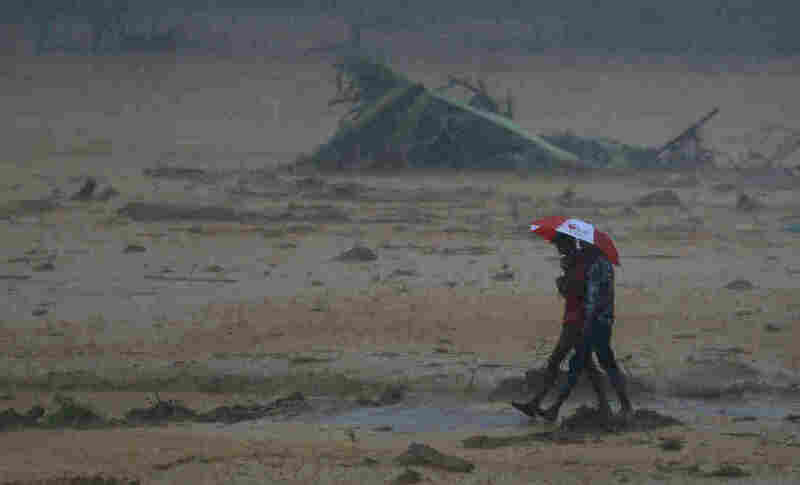 PHOTOS: Rain Hampers Search For Families Missing After Sri Lankan Landslides : The Two-Way Landslides in Sri Lanka on Tuesday night crushed three villages and left more than 200 families missing. Fresh rains have impaired rescue operations. People walk toward safety during a minor landslide following heavy rains in Elangipitiya village in Aranayake, Sri Lanka, on Wednesday. 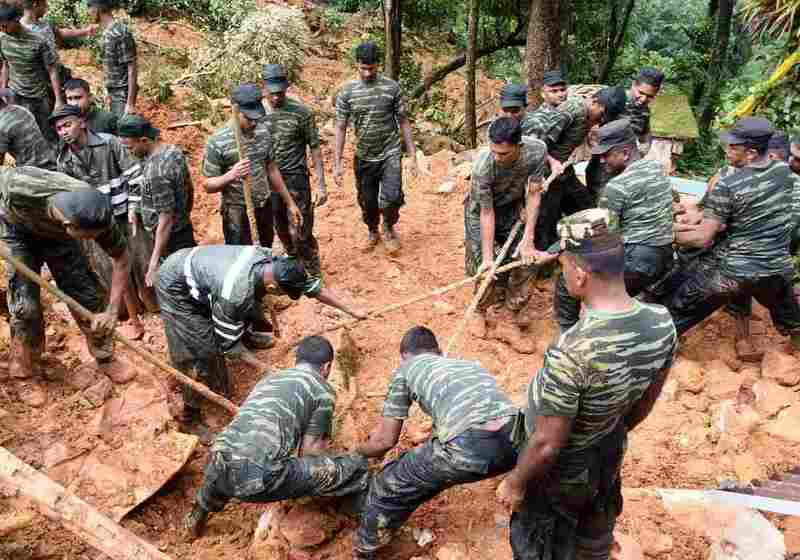 Soldiers and police used sticks and bare hands to dig through mud covering houses in three villages hit by landslides in central Sri Lanka. Two days after landslides buried three villages in central Sri Lanka, rescuers have struggled with fresh rain and more landslides as they attempt to find missing families. 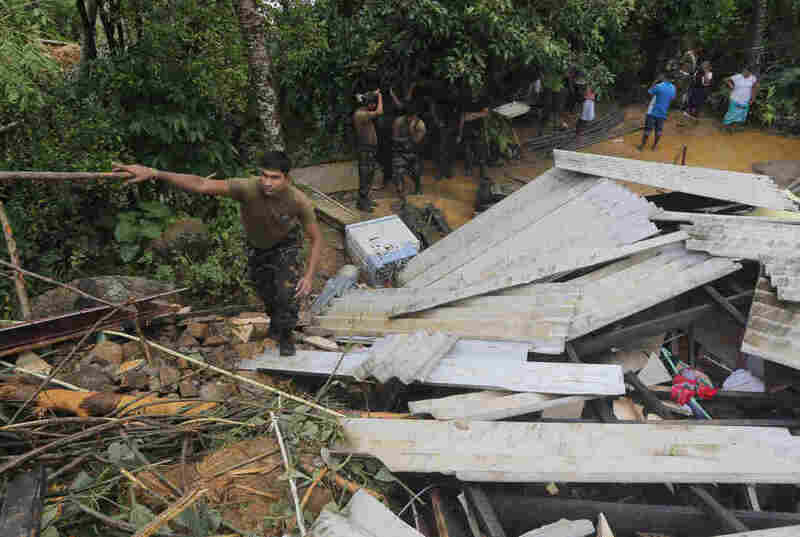 "The [Sri Lanka Red Cross Society] said in a statement that it had dispatched two rescue crews to help in the search for survivors. 'Electricity was cut off completely last night making it difficult for rescue teams to reach the locations,' the statement read." 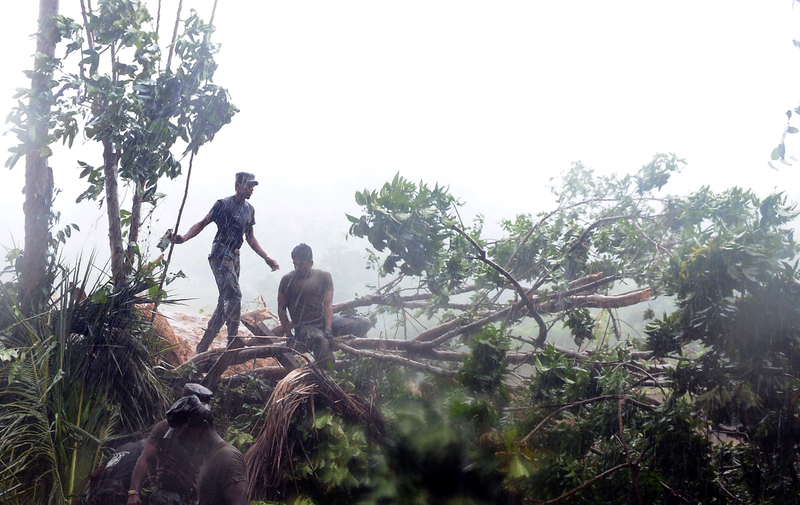 Sri Lankan military personnel engage in relief and rescue efforts Thursday in Aranayake. Heavy rains have hampered the search for survivors. On Thursday, soldiers and police were struggling to find the missing, The Associated Press writes. The ongoing threat of landslides forced work to halt temporarily. "Near Elangapitiya, the village furthest down the hill, soldiers carried bodies to a school where families waited for news of missing loved ones. The school entrance was decorated with white flags, a symbol of mourning. "Farmer Hewapelige Lal said he had identified the body of his nephew, but that 18 other family members were possibly buried under the mud. He and his wife had left their home to take fruit to a daughter who lived elsewhere, but at some point his wife turned back. 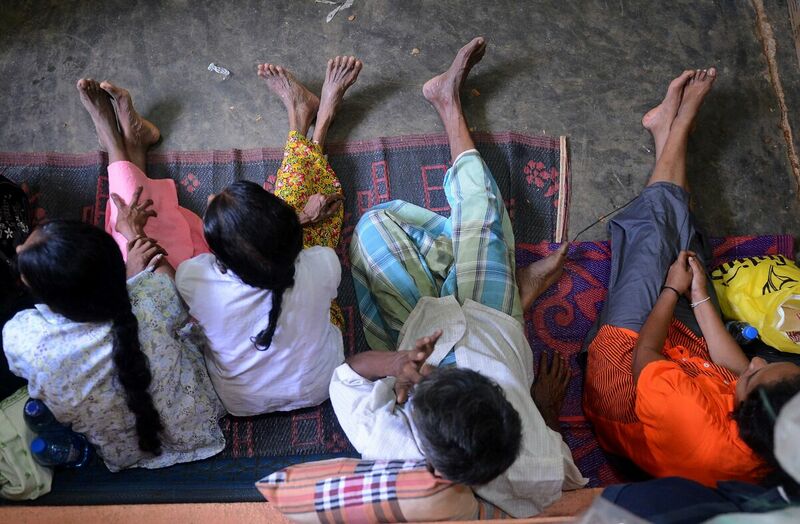 Sri Lankan children rest at a relief camp on Thursday. Dozens of bodies have been recovered so far, according to news reports, but the death toll is expected to rise significantly as bodies are dug out from beneath the rubble. Maj. Gen. Sudantha Ranasinghe, who is in charge of rescue operations, told Reuters he didn't expect to find any survivors. "There are places where the mud level is up to 30 feet," he said. "We will keep going until we can recover the maximum." Reuters notes that mudslides are a common occurrence in Sri Lanka, where deforestation for agriculture has been widespread.